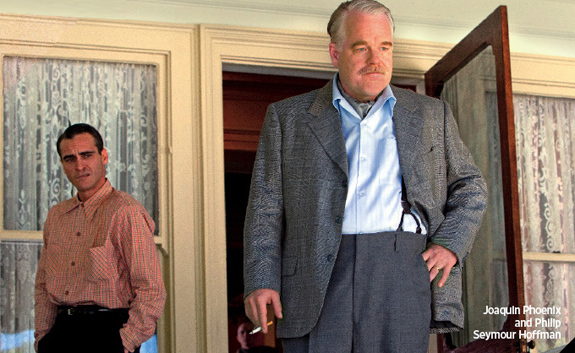 The new Fall Movie Preview of issue of Entertainment Weekly has arrived and features a preview of "The Master" along with some quotes from Philip Seymour Hoffman and producer JoAnne Sellar about the project, specifically the connections to L. Ron Hubbard. (They both downplay them.) Quotes have been excerpted below. "It's not the L. Ron Hubbard story. [Scientology] was one of the bigger movements at the time, but there were a lot of movements at that time," says Hoffman. "There's nothing about how I'm behaving or talking that echoes [Hubbard]. I thought of a lot of other bigger-than-life personalities, charismatic people like Orson Welles." "People are going to have to draw their own conclusions to that aspect of the movie," says producer JoAnne Sellar. "[Anderson] is interested in how veterans came back from World War II. They were these lost souls who were uncertain about their future." "Joaquin's character is like a beaten dog," says Hoffman. "No matter where he goes, [Quell] gets into severe trouble. And somehow I'm able to deal with him." In addition to the 3 new stills in EW, 9 images from have made their way online courtesy of Joaquin Phoenix Central and 3 more from The Film Stage. You can view all the new images (like the one above) over at our Facebook page. We've also gotten word via Twitter that there may be a new trailer for the film playing in front of "The Bourne Legacy" in theatres this weekend. If you happen to catch it, please drop us a line. I don't know when I've been more excited about a movie. Same here. Never been more excited about a movie in my life. I can't wait to bask in the brilliance that is THE MASTER. I am waiting for it.. Although some people may be unable to define charisma, most can name a few charismatic people they have known. A charismatic leader which graced history was Winston Churchill. He came to power in the middle of World War II, and upheld the morale of the British people during a very difficult time of the war.